To find the best investments, focus less on share price and more on picking companies with strong growth and performance potential, such as Johnson & Johnson, Home Depot and Sherwin Williams. Many investors prefer to load up on stocks when indexes are down, because depressed prices when they buy improve their chances of solid returns when they sell. Broad market rallies, on the other hand, can make picking the best investments more difficult. However, attempting to time the market is not the best way to invest money, and bull markets still offer plenty of great deals -- particularly for those whose investment strategies are focused on the long term. Below, we'll highlight three blue-chip stocks that appear to be among the best stocks to buy today despite their record-high prices. Healthcare titan Johnson & Johnson (NYSE:JNJ) has a long history of blowing through record-high stock prices. In fact, shares have risen at an astounding 11% compound annual rate over the past 30 years. They're up 25-fold since 1985. JNJ share price at year-end, adjusted for stock splits. Chart by author. Data source: Mergent, via Johnson & Johnson. Its recent quarterly results help explain how J&J's track record can stay so consistently positive. The pharmaceutical business, consumer product segment, and medical device division each contributed industry-thumping sales growth. At the same time, the company made a big down payment on its future market-share lead – R&D spending rose at a double-digit pace, to $2.3 billion, which is a rate that almost no other company could match. Given those strong metrics, it's no surprise that CEO Alex Gorsky and his executive team raised their top- and bottom-line forecasts for the year. Management now expects to produce $6.68 per share of adjusted earnings for an 8% boost following 2015's 3% profit decline. Steady market-share gains in attractive niches across the healthcare industry should power increasing returns for investors from here. Unlike healthcare, the housing market is highly cyclical. Spending on home improvement spikes when the market is strong, and slumps during recessions. 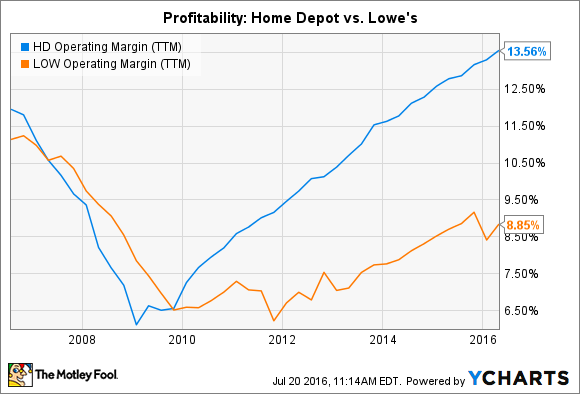 A massive downturn, like the one that started in 2007, forced Home Depot (NYSE:HD) into cash-preservation mode as it paused dividend hikes for three years, giving rival Lowe's (NYSE:LOW) bragging rights for being the only home-improvement retailer that's also a Dividend Aristocrat. Yet Wall Street continues to value these two rivals as if they are part of the same business. Both are priced at roughly 21 times expected earnings. Sure, that's a premium to the broader market's valuation; but it also implies better long-term growth for Home Depot's shares, as long as it can keep generating heftier profits through initiatives like building a stronger online business, and expanding its retailing presence. Sherwin Williams' (NYSE:SHW) stock has produced plenty of record highs over the years, and 2016, with its 19% return so far, is no different. A key driver of that performance is SHW's powerful retailing setup that blends blockbuster global brands with company-owned paint shops. No other paint-and-finishings producer has as much control over the pricing, display, and distribution of its products. Sales growth wasn't especially strong last year, clocking in at 2% compared to the prior year's 9% spike. Yet Sherwin Williams' financial performance has been stellar. Since 2013, annual operating cash flow is up 40%, return on assets has nearly doubled to 18% of sales, and the company's bottom-line profitability has improved from 7% to a record 9%. That sturdy performance powers increasing cash returns to shareholders with a dividend that's more than doubled in the past five years, even as its payout ratio -- or the percentage of earnings dedicated to the dividend -- has declined to just 25%. Investors might prefer to snap up a dividend like that at a discount, but it may be a mistake to ignore this stock simply because the business has earned a premium valuation by growing more profitable.